It’s not Alice, it’s Sophie. Alice was her name – my great-aunt on my mother’s side. There are no pictures any more, no paintings like there used to be, not that I was alive when they were there… forty years ago, maybe? Fifty? I never got to meet her. Mum and Dad would visit her in the mental asylum, with my nanna and granddad. They wouldn’t let me go too. I was ‘too young’, I was ‘too impressionable’. In other words, they were ashamed of her. They didn’t want me to be tarred with the same brush and they didn’t want me to have any connection with her. She disappeared about a year ago. She came to my window, and gave me a diary. I never said anything to anyone. They were told that she died; they didn’t care. The asylum didn’t want the hassle of the investigation, so they said she died, and nothing more was ever said about it. There was no ‘funeral’, no memorial service. She was gone, and they were glad to be rid of her. Maybe now the tar would begin to fade. Maybe now they wouldn’t be the family of ‘that nut who had those crazy dreams’, and maybe now kids wouldn’t be scared to knock at the door on Halloween, in fear of the stories their parents had told them. But of course, it wouldn’t be that easy would it. Life never is. It was that night, the night she gave me the diary that the ‘dreams’ started. At first I thought it was because of the diary itself. I read through it; it was full of detailed, exquisite pictures of the characters of her dreams: The Cheshire Cat; The Mad Hatter; Queen of Hearts; Absalom; The White Rabbit. Everyone was there. 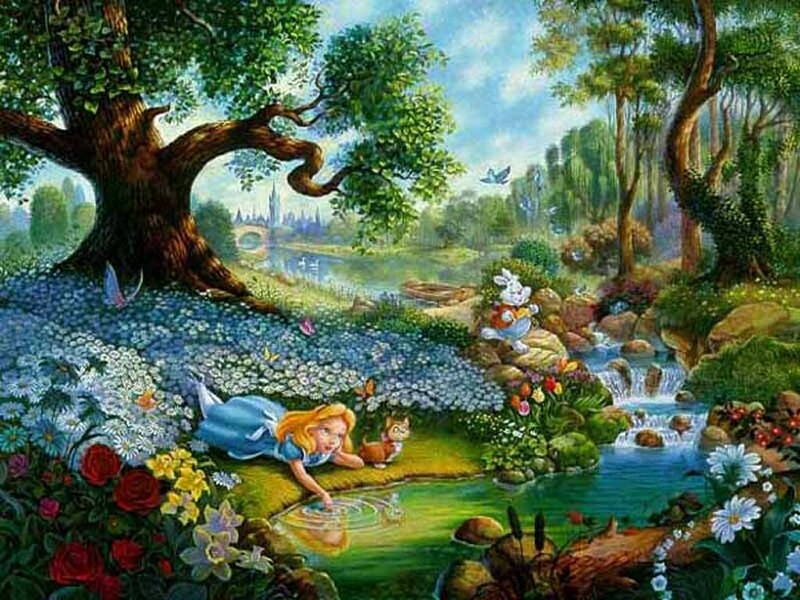 And then there were stories of her times in this place called Wonderland. How she slayed the Jabberwocky, played Croquet with the Queen herself and infiltrated the castle by eating a piece of cake that made her big. It was that night that I dreamed of Wonderland. I was woken by a light rapping at my window, though there was nothing there when I went to investigate. I slipped back into bed and it happened again. This time I saw him. The White Rabbit, with his waistcoat and top hat, his watch… just as Aunt Alice had drawn. I stood in shock. It must be because I read the book, I reasoned with myself. I still didn’t move. He was talking! I snapped back to reality, and found myself stepping into my slippers.